* The Company reported that by selecting for cells with sufficient levels of the immortalizing protein telomerase, they were able to reset the clock of aging back to the embryonic state. * Using the new technologies of reprogramming, BioTime scientists showed that time’s arrow of development, as well as aging, could be reversed. * BioTime revealed why existing Induced Pluripotent Stem (iPS) cell lines being studied showed signs of premature aging, and a means to overcome that roadblock. * This new capability does not require the use of human embryos or egg cells. * BioTime’s reversal of developmental aging may be the seed for future technologies that will one day allow young cells of any kind to be produced that might be useful for aging patients in repairing the heart, the blood system, the brain, and the retina, as well as many others applications. In this way, we might increase the “healthspan,” that is, the years free from expensive and debilitating disease. 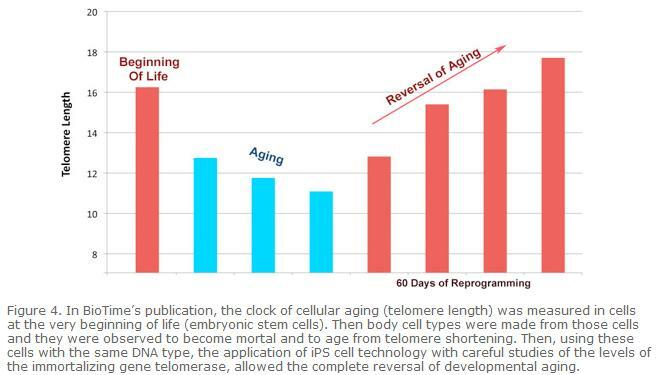 In BioTime’s report, we show that the premature aging observed in the existing iPS cell lines studied was due to the fact that the telomere clock of cellular aging in at least many of the lines being used in the scientific community is set at a relatively old (short) level. However, using a system where cells with the same DNA type at young embryonic states, as well as aged states were used, BioTime scientists reported that by looking for cells with sufficient levels of the immortalizing protein telomerase, they were able to reset the clock of aging back to the embryonic state. So, both the process of development wherein the germ-line cells specialize into the cells of the body, and also the telomere clock of aging was reported in the study. This reversal of developmental aging may be the seed for future technologies that will one day allow young cells of any kind to be produced for aging patients for use in repairing the heart, the blood system, the brain, and the retina, as well as many others applications. 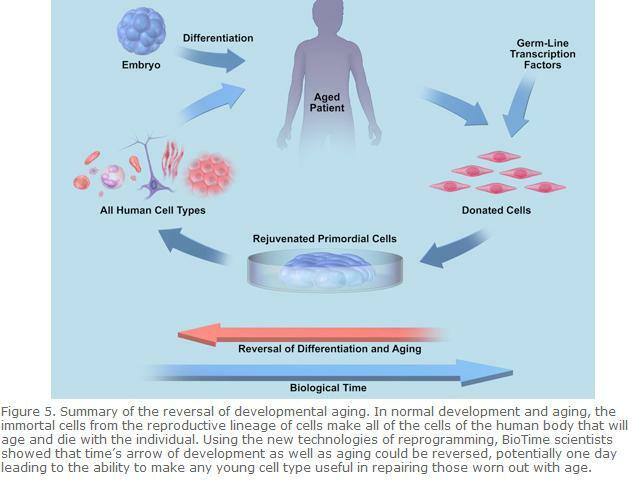 In the article, BioTime and its collaborators demonstrate the successful reversal of the developmental aging of normal human cells. Using precise genetic modifications, normal human cells were induced to reverse both the “clock” of differentiation (the process by which an embryonic stem cell becomes the many specialized differentiated cell types of the body), and the “clock” of cellular aging (telomere length). As a result, aged differentiated cells became young stem cells capable of regeneration. The paper sheds light on the recent controversy over the aged status of induced pluripotent stem (iPS) cells. iPS cell technology has excited the scientific community because it has been demonstrated to be a method of transforming adult human cells back to a state very similar to embryonic stem cells (reversing the process of development) without the use of human embryos. However, recent reports have suggested that iPS cells, though very similar to embryonic stem cells in many respects, may not have the normal replicative potential of embryonic stem cells (that is, the iPS cells may be prematurely old). This problem has been called “the Achilles heel of iPS cell technology.” BioTime scientists and their collaborators show in this paper that many iPS cell lines currently being circulated in the scientific community have short telomeres, meaning that their clock of cellular aging is still set at the age of relatively old cells. However, among these prematurely old cells, other cells can be found with sufficient levels of telomerase (a protein that keeps reproductive cells young) that allow these cells to reverse cellular aging all the way back to the very beginning of the human life cycle.